Pic the Gift gives customers a new unique way to customize in style with personalized Infinity Scarves. The Infinity Scarf comes in both adult and youth sizes! Recognized for their ability to customize and personalize just about anything, Pic the Gift has increased their product line by giving customers the ability to personalize new Infinity Scarves. The scarves are perfect for the person who loves to show off with one-of-a-kind style. The Infinity Scarf is 34.5″ wide and 61″ tall and made out of soft and vibrant material that has quality color retention. This scarf is the perfect size for adults but also comes in a smaller youth size of 20" x 44" that is great for children. An infinity scarf is a large, closed loop of fabric that can be worn in a variety of ways. This scarf is so versatile that it can even be worn as a capelet or shawl. 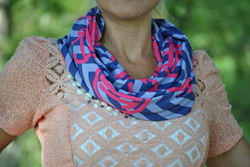 People who wear infinity scarves enjoy accessorizing and adding flair to their outfits. The ripples and folds make an intriguing texture, with no effort. The greatest thing about infinity scarves is that they never end, they will just keep going on, and on, and on! A great feature about Pic the Gift’s online designer is the infinite possibilities for customers to personalize their own infinity scarf. Customers have the ability to create their own designs with custom fonts, backgrounds, uploaded photos from their computer, Facebook, or Instagram and more. The designer provides stock designs, templates, clip-art images, and special effects great for designing a one-of-a-kind product. While customers are designing their scarf, the manufacturer suggests paying close attention to the decorating instructions and keeping the design within the design boundaries. For customer convenience, a center line is shown to represent where the infinity scarf will be folded to help guide those who would like to place a monogram in the center. Pic the Gift has manufactured in the USA for over 50 years in St. Louis, Missouri. They only produce high quality personalized products and picture gifts. The company is Green and recycles 100% of components from the production process. Pic the Gift’s biggest goal is making their customers “WOW” by creating unbelievable creative, personal gifts. For more information please visit http://www.picthegift.com/.